We have written extensively about the HDFC Diners 10x program. HDFC Bank Diners Club 10X Rewards were my favourite kind of reward currency primarily due to some offbeat transfer partners they provided in India. The list went away in 2016, but still, I look at it as a 33% cashback card, with all the cashback going towards travel. The list of 10X partners frequently gets updated, but no major shakeups, until now that is. The focus has been on travel & e-commerce. They initially put out a year-long list of partners, but then recalled it, and started to extend the date of the promotion by the months. Here are the announcements for April, May, June & July 2016. Then, it got extended through March 2017 but applied caps on reward earning per month, and a one-month extension through April 2017. In May, they put a new list valid through July 2017. Subsequently, they added all categories of SmartBuy on the list as of July 2017. In the last reveal, they knocked off the travel category. You can now access this category through SmartBuy which is for everyone who is an HDFC Bank Credit Card Holder. Today, HDFC Bank has confirmed that SmartBuy would continue through March 2019. This is in line with their previous line of thinking, where they extended the promotion through December 2018. Comparison shopping via the SmartBuy website. The maximum number of reward points you can earn per cycle is 25000 Reward Points, and the promotion does not apply to EMI transactions. These are over and above the reward points towards the usual 10X cycle every month. This list would be valid through March 2019. For Treebo, only online transactions will get 10X points, not pay at hotel. Uber transactions done abroad would also count for 10X Rewards. The new changes to the T&C are perhaps towards the people gaming the system. Purchase of gold and Gift Vouchers on TataCLiQ is not eligible for 10X offer. Also, now, only package bookings are eligible for 10X on SOTC and flight or hotel bookings alone aren’t eligible. Here is the cap installed on the number of points you can earn per statement cycle this year for using partner brands. Everyone can earn up to 25,000 Reward points for using the Smartbuy portal. The 10x points are not applicable to the HDFC Bank JetPrivilege co-branded Diners card. There is no extension on the 10X for International Spend at the moment. What do you think of these changes to the HDFC Bank Diners Club 10X program? « Travelling this new year: Base Fare Ticket Codes going for free! Is 25K limit applicable on 10X or the 9X. I have read somewhere that Limit is only for accelerated points. Does that mean i can do transactions of 83400/- and still earn 25K accelerated points and ~2.8K normal points ?? @Surya, you are correct. the bonus points are limited, not the base points. It is mentioned that under TnC of smart buy that it is valid for emi transaction on Flipkart. Can someone please confirm it? And will I get points during every emi payment or month of transaction? 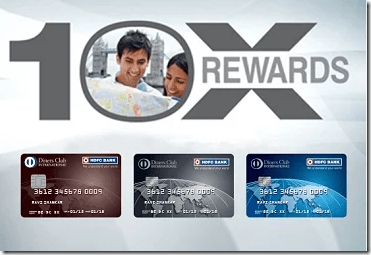 Is the 10x benefit also available for HDFC Infinia card members? The smartbuy website states that it is for all HDFC card holders but Infinia website does not even mention Smartbuy! @AB the Smartbuy 10X yes, the partner brands one, no. Emi transactions on Amazon will still qualify for 10x rewards as per t&c on Amazon. Any word on the 10x on international POS transactions extended beyond Dec 31st’18? So you can technically get 16.5% on your DCB without any spend limits. Thats also Kickass when making high value transaction on mmt for flights. @Priyansh, what a coincidence, that is the next article coming up. This is not true is it? I made a ticket purchase on MMT using this offer and they, first of all, “forgot” to add the points to my account and when I raised a complaint, added only 5000 points (instead of about 15000) saying 5k is the max they give under this offer. How you identified the points they added? As they don’t send the detailed report of points. Just a clarification, if I buy products in Flipkart via Smartbuy for Rs.1,00,000 and if I book Holiday package with SOTC for Rs.1,00,000, will I get 25000 points + 25000 points or is it capped 25000 for all the transactions? What I can see on their website is 25000 cap for Smartbuy & 25000 cap for other partners. @Surya, you are absolutely right there. you get 25K + 25K in this case. Hi any word on the 10x on international POS transactions? Can you please share the source for below info? Was this valid earlier or it something newly added from today? Newly added in this cycle. Am guessing lots of people did both last quarter.